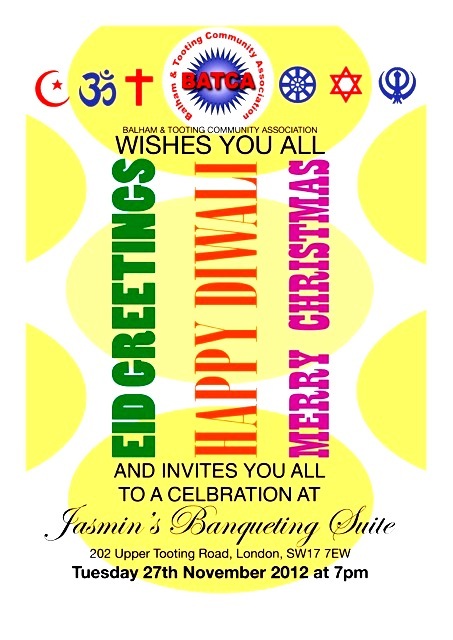 “It’s a social get together with food for those of all faiths and cultures to celebrate Eid, Diwali and Christmas. There’ll be entertainment reflecting each of the faiths. The aim is to give everyone an opportunity to chat and mingle with those from other backgrounds. As a long-running and successful local event, it’s a good one to visit if you’re thinking of organising something similar in your borough. This entry was posted in London, Peace-building, Wandsworth and tagged BATCA, Christmas, Diwali, Eid, Tooting by Catriona Robertson. Bookmark the permalink.